Make holiday magic with the Eco Smart 150-Light LED Warm White String Light Set. The 50.6 ft. strand features 150 ambient C6-shaped bulbs placed 4 in. apart to create a dazzling display. Connect up to 24 sets indoors or outdoors for convenient, one-plug decorating. Decorate your home, bushes, trees, or posts. Get creative! Long-lasting, flicker-free lighting to provide a consistent, ambient glow. The super-efficient LED bulbs use up to 80% less energy than traditional bulbs, keeping electricity costs minimized. Safely connect up to 24 sets for large-scale indoor or outdoor decorating that uses only one plug. The weather-resistant sealed sockets, you can feel confident that your light display will stand strong throughout the holiday season. Wherever you decide to place these high-quality C6 lights, you can be sure they will light up any space in a big way! Create your own glowing white winter wonderland! 150-Light Warm White LED C6 Christmas Lights Make holiday magic with the Eco Smart 150-Light LED Warm White String Light Set. The 50.6 ft. strand features 150 ambient C6-shaped bulbs placed 4 in. apart to create a dazzling display. Connect up to 24 sets indoors or outdoors for convenient, one-plug decorating. Decorate your home, bushes, trees, or posts. Get creative! Long-lasting, flicker-free lighting to provide a consistent, ambient glow. The super-efficient LED bulbs use up to 80% less energy than traditional bulbs, keeping electricity costs minimized. Safely connect up to 24 sets for large-scale indoor or outdoor decorating that uses only one plug. The weather-resistant sealed sockets, you can feel confident that your light display will stand strong throughout the holiday season. Wherever you decide to place these high-quality C6 lights, you can be sure they will light up any space in a big way! Create your own glowing white winter wonderland! 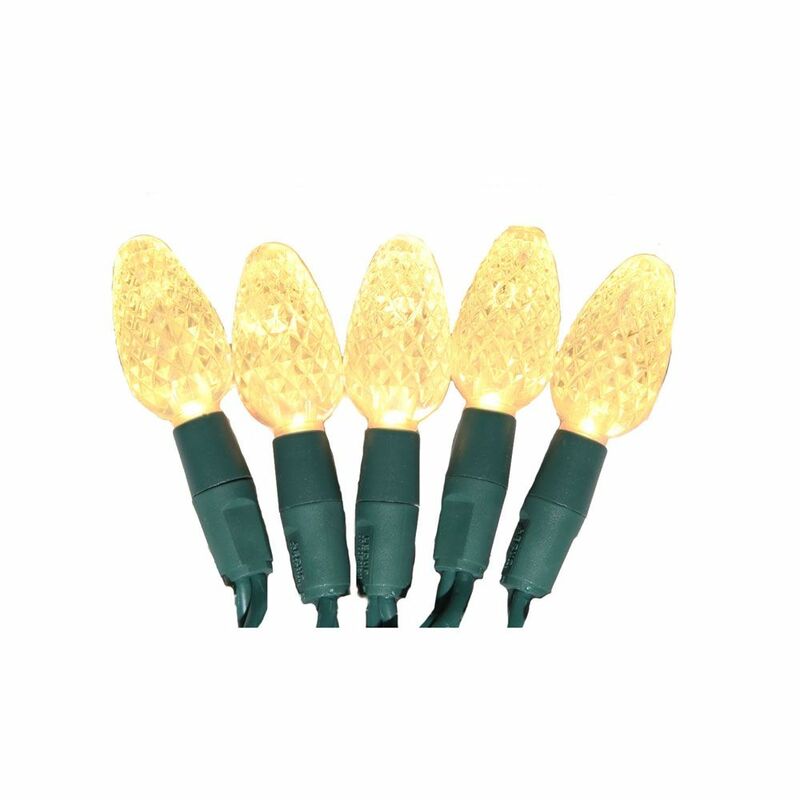 150-Light Warm White LED C6 Christmas Lights is rated 1.0 out of 5 by 2. Rated 1 out of 5 by Rick1235 from Only half the roll works I bought 3 rolls and got one set out of the roll, plugged it and only half of the set worked, then thought I would plug another set and it also had the same issue. Third roll worked OK. Got full refund for the 3 rolls as I totally lost confidence in the product at that point. When tested at the store only one set did not work. Something is kind not right with the wiring. Can't take a chance to put this up my 30 feet Colorado blue spruce as it is very unreliable. Too bad as the product looked very well made. Rated 1 out of 5 by kvnlalonde from Absolutely Terrible Cheap Product! Don't waist your time with these lights, just bought two strings of these got all set up to install them and thought I should plug them in to make sure they are working. Both sets only half the string was working, they have a manufacture splice in them and they both failed at the splice. Also the decorative covers where coming off all over the place.... Terrible product don't waist your time on these.